Evansville, Ind. 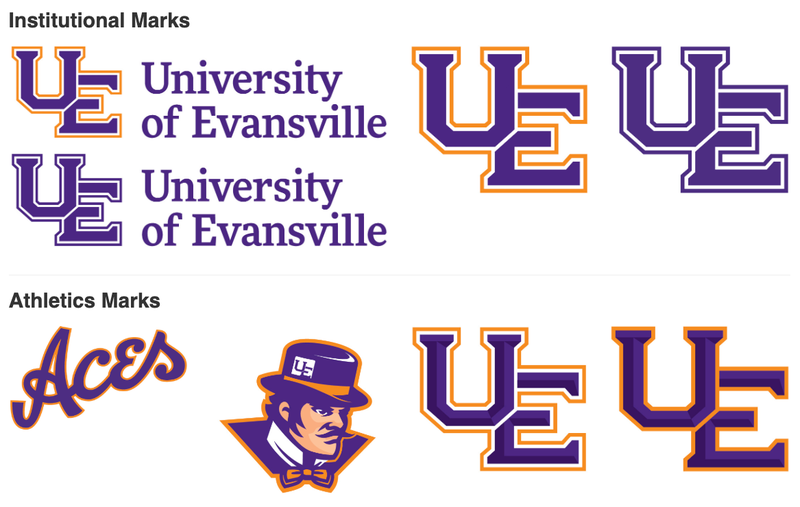 – The University of Evansville unveiled its refreshed institutional marks including logos, updated mascot, and branding platform during an on-campus press conference on Friday. The event was led by president Christopher M. Pietruszkiewicz who was joined by Shane Davidson, vice president for enrollment and marketing; Mark Spencer, athletic director; and Walter McCarty, head men’s basketball coach. WHY WAS A REBRAND NECESSARY? The University of Evansville and its athletics department each had logos and branding that did not resonate in the Evansville community and across the country. There was a lack of a strong and unified brand that did not portray the desired message. An updated, cohesive rebranding initiative was necessary in order to bring the institution and athletics together for one cohesive, modern look that will give the University of Evansville and the athletics department a unified message. Ologie also created an extensive brand framework that will set the University of Evansville apart in the marketplace by highlighting its transformative education and the unique positioning of the Ashoka U Changemaker Campus designation and the changemaking culture that empowers students to improve the world around them. WHO DESIGNED THE NEW LOOK? WHAT WAS THE PROCESS AND TIMELINE FOR THE REDESIGN? In August of 2018, the rebranding committee, co-chaired by vice president for enrollment and marketing Shane Davidson, and athletic director Mark Spencer, was formed. After a nationwide search, the rebranding committee chose to partner with Ologie and their work began in September 2018. WHAT IS THE TIMELINE FOR USE OF THE NEW LOGOS? Today’s press conference signified a local launch of the branding and logos. Certain digital platforms including University and athletic websites and social media will adopt the new logos immediately. Signage and publications on the UE campus will utilize the updated logo over the coming months. Athletic uniforms and apparel will reflect the updates as teams enter the next purchase cycle. Fully rebranding the campus and athletic facilities is a time-consuming and expensive endeavor. This process will be completed giving priority to highly visible locations and only as funding is identified. Apparel and other items with the new logo are now available for purchase online here. View the new logos online. Email uerelations@evansville.edu for more information or questions.